Supreme Court Cuts Damages in Exxon Valdez Spill After nearly 20 years, Exxon Mobil Corp. will have to pay punitive damages for the massive Valdez oil spill in Alaska. But in its ruling Wednesday, the Supreme Court slashed those damages to about $500 million. 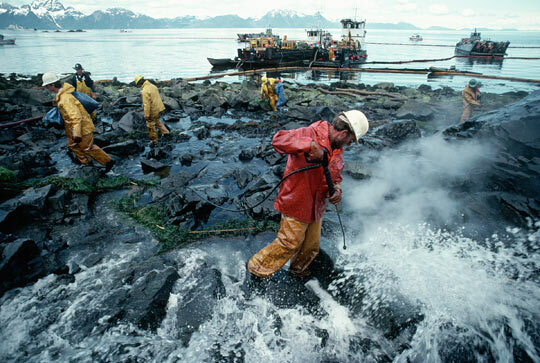 Workers clean oil-covered rocks in Alaska near the site of the Exxon Valdez oil spill in 1989. 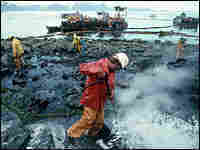 After nearly 20 years, Exxon Mobil Corp. will have to pay punitive damages for the massive Valdez oil spill in Alaska. But in its ruling Wednesday, the Supreme Court slashed those damages to about $500 million. The plaintiffs — fishermen, landowners and native Alaskans — had hoped for much more. A lower court had ordered the company to pay $2.5 billion in punitive damages, but in its opinion, the Supreme Court found that amount excessive. The high court said that under federal maritime law, punitive damages shouldn't be any larger than the compensatory damages the company had already been ordered to pay. In other words, the company shouldn't have to pay more in punishment than the actual damage it caused. The Exxon Valdez ran aground in Alaska's Prince William Sound in March 1989, spilling 11 million gallons of oil — the largest spill on record in North America. Exxon had asked the high court to reject the punitive damages judgment, saying it already has spent $3.4 billion in response to the accident, which fouled 1,200 miles of Alaska coastline.